Dnigma Howard, 16, was originally charged with two felonies. 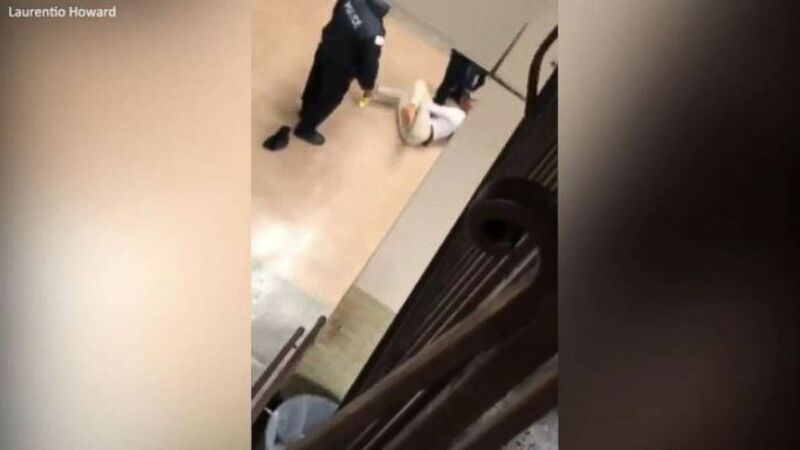 The actions of two former Chicago school resource officers toward a 16-year-old student, including dragging her down a flight of stairs and Tasering her three times, are being further called into question after the release of new surveillance video on Thursday. Dnigma Howard, 16, had allegedly disobeyed a teacher who told her to put her phone away when she was kicked out of class in the early February incident. Her father, Laurentio Howard, has come to John Marshall Metropolitan High School to pick up his daughter when a confrontation between the teen and two school police officers deteriorated into a physical fight. In cellphone video shared days later, Howard can be seen at the bottom of a flight of stairs, kicking out at the officers -- one male and one female -- but it's unclear what led up to the incident. School surveillance video newly released by Chicago ABC station WLS on Thursday tells a different story than what police said at the time -- that the 16-year-old began fighting the officers. Instead, in the surveillance video, Dnigma Howard and an officer can be seen standing at the top of the stairs when the officer grabbed her and tackled her to the ground, then dragged her down the stairs by one leg. (WLS) A school resource officer at John Marshall Metropolitan High School in Chicago can be seen dragging a 16-year-old girl down a flight of stairs in a February incident. Two officers were reassigned after the confrontation. "In the video you can see they pull her by the leg down the stairs, the whole flight of stairs," Laurentio Howard, who was standing by as his daughter was punched and Tased, told WLS. "I thought maybe they were going to try to choke her out or she would lose consciousness or something like that," he added. "They had their foot on her chest. She has asthma, she's telling me she can't breathe." A police spokesman said the officer have been assigned to "different duties with the district." The Civilian Office of Police Accountability "has not given us a recommendation to relieve them of police powers as of yet," the spokesman added. One of the officers is currently on medical leave, the spokesman added. "We hold our officers to the highest level of professional standards. CPD will remain guided by the facts of the investigation," the department said in a statement. "Due to the fact that this incident is currently under the jurisdiction of COPA for the purpose of an independent investigation, we cannot comment on the specifics of the incident or the investigation." (Laurentio Howard) Two Chicago police officers are being reassigned after a physical confrontation with a 16-year-old student was caught on camera by her father. Dnigma Howard was initially charged with two felony counts for aggravated battery against a peace officer. Those charges were later dropped by the State's Attorney's Office. "The Board of Education and the Chicago Police Department continue to fail our children," Howard's lawyer, Andrew M. Stroth, said. "An unarmed, 16-year-old girl was beaten, kicked, punched and Tasered by Officers Johnnie Pierre and Sherry Tripp at Marshall High School. The Inspector General's report and the Consent Decree have made clear recommendations to effectively address the issue of police in school." Stroth also called on Mayor-elect Lori Lightfoot to "address this important issue and make our schools safe." ABC News' Alondra Valle and Andy Fies contributed to this report.